Perhaps no movie has ever received the same level of hype as "Star Wars: The Force Awakens." The J.J. Abrams-directed film is the first new installment in the "Star Wars" franchise since 2005's "Revenge of the Sith," as well as the first non-prequel since 1983's "Return of the Jedi." The second fact is the more important one for many longtime fans, who remember seeing or at least growing up with the original trilogy, but were somewhat let down by the trio of George Lucas-written prequels that began with 1999's "The Phantom Menace." Their hope, like ours, is that Episode VII will bridge the old and new: Basically, that it will bring back some of the magic of the originals (Episodes IV-VI, though some would draw the line after Episode V) while paving the way for the next generation of the "Star Wars" universe. In this way, the current state of "Star Wars" provides a useful way for understanding the infrastructure evolution situation that many IT organizations now find themselves in. Organizations may quickly run into difficulties if they treat their DevOps initiatives as simply a new type of silo, one that is focused intensely on virtual and cloud assets without ample attention paid to legacy and physical infrastructure. You could say that a similar tack was taken with the first Death Star: Despite all of the focus on its planet-destroying weaponry and enormous tractor beam (which hauled in the Millennium Falcon), the space station's designers neglected its basic heating infrastructure, eventually settling on a small exhaust port that was vulnerable to torpedo attack (and indeed was destroyed in that exact way). 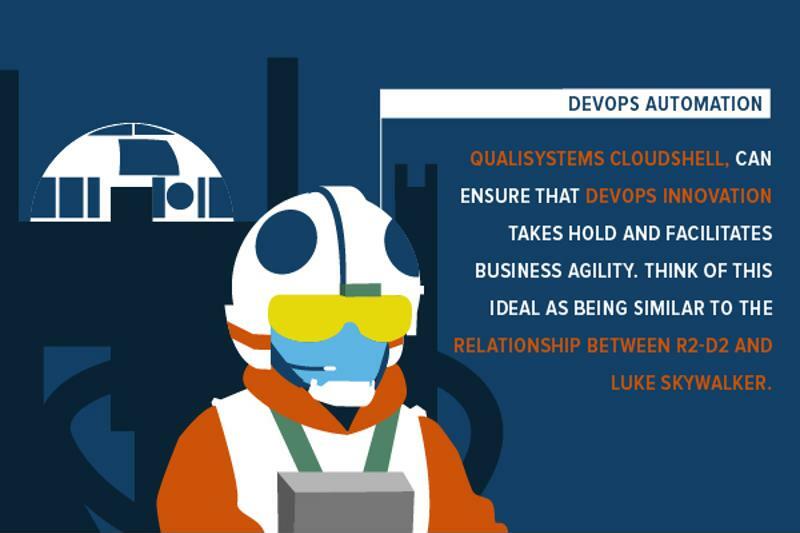 On the other end of the spectrum, creating a culture of collaboration supported by highly capable technical tools, such as Qualisystems CloudShell, can ensure that DevOps innovation takes hold and facilitates business agility. Think of this ideal as being similar to the relationship between R2-D2 and Luke Skywalker when the latter was piloting his X-Wing Fighter. There was not only a good understanding between the two of them, but also the powerful automation capabilities provided by R2's advanced circuitry. The new Star Wars movie provides an occasion to see how old and new infrastructure, like that inside the Millennium Falcon, can work together. Overall, we can see here both a "dark side" and "light side" approach to DevOps transformation. An old joke about the Force is that it is a lot like duct tape, i.e., it has a dark side and a light side and it holds everything together; something similar could be said about the variety of infrastructure types that support critical business applications. They can cause a lot of problems (e.g., they probably can't match the credit card swipe convenience of Amazon Web Services), they can provide some key advantages (e.g., by being easy to control and secure on-premises) and ultimately they are essential cogs for supporting a wide range of applications, especially within bimodal IT setups. Since we are on the subject on supporting and holding things together, we should talk a little about the Millennium Falcon, a ship that always seemed to be on the verge of breaking down in the original films. Its hyperdrive for making the leap to lightspeed was spotty at best, and it took its fair share of bruises. Keeping it in working order and out of the clutches of the Empire was a full-time job for Han and crew. "The Millennium Falcon was a weird mix of old and new technologies." Part of the problem was that the Falcon was this weird mix of old and new technologies. It could travel at warp speed, fire lasers and make the Kessel Run in less than 12 parsecs. But it also required human pilots and gunners, plus it was accurately labeled a "bucket of bolts" by Princess Leia Organa during a critical escape sequence. Maybe the Millennium Falcon would have run a lot more smoothly if it had a self-service portal that helped keep tabs on what was going on around its decks. Are the ship's countless modifications playing nice with its older components? Is there a technical problem hidden in one of its smuggling holds? Is the holographic Dejarik table from Episode IV eating up too many resources? Having a centralized automation platform would have helped with these issues of accountability, visibility and IT governance. One could say that the Millennium Falcon was already a rough approximation of environment-as-a-service, since it passed muster in automating a lot of heterogeneous infrastructures implemented and modified by its various owners. But it could have gone further in bridging the gap, just as many IT organizations can take additional steps to ensure DevOps automation success by working with software such as CloudShell. The takeaway: "Star Wars: The Force Awakens" provides an occasion to do more than sit back and enjoy the lightsaber fights - it's also a moment to see how old and new infrastructure, like that inside the Millennium Falcon, can work together. With an EaaS and self-service automation solution, IT organizations can bring their legacy, physical, virtual and cloud assets together into a more agile combination.